Drainage, the art of freeing land from superfluous water by causing it to flow off in channels or through porous substances. The system of drainage adopted for cities and towns will be treated in the article Sewerage. The art is of especial interest in its application to the reclaiming of wet lands, and the improvement of those through which water does not find a ready exit. The ancient Romans constructed open drains for conveying the superficial water from their lands. In England, public attention was directed to the injurious effects of water retained in cultivated lands by the treatise of Capt. Walter Blyth in 1652. The author condemned the shallow open drains in common use, and recommended straight trenches reaching below the spring of "cold, spewing, moyst water," which he regarded as the source of the "corruption that feeds and nourisheth the rush or flagg," even to the depth of three or four feet, and the filling in of the trenches with stones, or fagots covered with turf. It was long before the excellence of this system was generally recognized, and little attention appears to have been directed to it until the latter part of the next century. 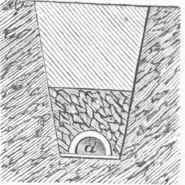 About the year 1764 a farmer of Warwickshire, Mr. Elkington, discovered that when an impervious stratum beneath the soil was perforated, the water welled up and flowed away; and he hence inferred that the water in wet lands came chiefly from subterranean sources, and might be removed by tapping the stratum that confined it. On this theory he established an original system of drainage, and was remarkably successful in seeking out the sources of the water, which, after reaching by an auger, he drew off in a single deep channel. This system came into extensive practice in England and Scotland, and its imperfections were not fully appreciated till after the introduction of the system of James Smith of Deanston, in 1823. This was contrived with reference to the removal of the water on the surface, as well as that beneath the soil, and was in fact the practice recommended nearly 200 years before by Capt. Blyth. A series of parallel drains were sunk in the direction of most rapid descent, and, being partially filled with stones small enough to pass 1 through a three-inch ring, were covered over; with soil. At the bottom a main drain was constructed, generally in stone work or with tiles. The new practice met with great opposition from the advocates of Elkington's method, but finally came to be regarded as the only complete system applicable in all cases. In some instances the other plan may no doubt be economically adopted. The drains came at last to be made chiefly of tiles, for the manufacture of which the first machine was invented by the marquis of Tweeddale. The practice has been successfully introduced into the United States, and drain tiles are now a considerable branch of manufacture. - Wet lands are well known to be unfavorable to the production of large crops; it is also true that grains, potatoes, grass, etc, are sounder and better when raised upon lands not subject to excess of moisture. The soils that retain it are correctly described as cold, while the more porous soils are called warm. From the experiments of Mr. Parkes in a bog in Lancashire, it appears that by giving free passage to the water through a cold soil by thorough drainage, its temperature at the depth of seven inches may be raised 10° above that of un-drained adjoining land of the same quality. Thus drainage produces the effect of a warmer climate, and may add in fact many days to the season; and this not merely by reason of the warmth extended for a longer period, but in the spring the soil is sooner prepared for cultivation, and may be in condition for ploughing and planting even two weeks before neighboring land of similar quality in other respects would admit of working. While frequent accession of water is a great benefit to lands through which it finds a ready passage, its retention impairs in various ways the fertility of the soil. It prevents the pulverization of the earth by the plough and harrow, and the circulation of air to the roots of the plants. It nourishes a growth of noxious plants, and in woodlands its injurious effect is seen in the production of many lichens, fungi, and other parasites upon the trees. Open ditches may be made in the lower grounds, where natural streams are not convenient for receiving the drainage from the underground ditches, which are made by laying tiles in trenches and covering them with soil. 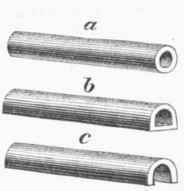 A section of an underground drain is represented in fig. 1. Sometimes coarse stones are used, but tiles are preferable on account of their less liability to become clogged. Several kinds of tile are made, each being suitable under certain circumstances. They are from 3 to 10 in. in diameter, and from 1 to 2 ft. in length. They are made of nearly the same kind of clay as brick, and are baked sufficiently to include as much porosity and toughness as possible. The different forms generally in use are represented in fig. 2. Any variety may be large or small. The horseshoe tile may be laid upon flagging or boards, and all of them should be placed deep, out of the way of frost and the plough. - In Europe the largest draining operations have been those for reclaiming immense tracts of submerged or boggy lands, some of which were altogether below the level of natural drainage. As early as 1436 attention was directed in England to the possibility of reclaiming the fens bordering the river Ouse and its tributaries, now known as the Bedford Level. These covered an area of about 400,000 acres, which in ancient times appears to have been in a condition for cultivation. The tract presents but very limited natural channels for conveying the water into the sea on the northeast. The attempt to embank and deepen these in the 15th century was unsuccessful, but it was renewed by the earl of Bedford in 1634. In three years he expended £100,000 in embankments for keeping out the waters of the rivers, and removing those within by pumping. This attempt also failed; but in 1649 his son recommenced operations, and succeeded after an expenditure of £300,000 more. From that time the lands reclaimed have been kept free from water by machinery worked by windmills. Among the numerous drainage channels cut through these lands are two nearly parallel, more than 20 m. in length, and both navigable, serving to cut off a long circuitous reach of the river Ouse. By other direct channels made during the present century above the outlet of the same river, and also of the neighboring river Nene, many thousand acres more have been reclaimed. The steam engine has been advantageously substituted in many instances for the windmills; and it has been found practicable to estimate closely the power and expense required to keep an area of given extent thoroughly drained. The annual fall of rain averaging 26 in., there would be, with a very moderate allowance for evaporation, 2 in. per month of water to be raised, or 1 1/2 cubic feet of water as a maximum on every square yard of surface. The amount on an acre, 7,260 cubic feet, may be raised 10 ft. and discharged in about 2 hours and 10 minutes by the power of one horse. A steam engine of 10-horse power could then each month raise to the same height and discharge the water from 1,000 acres in 232 hours. - The drainage of Haarlem lake m Holland, undertaken in 1839, was a gigantic operation of this class. From an area of 70 sq. m. of average depth of water of 12 3/4 ft., situated below the level of any sluices that could be constructed, it was required to raise the water an average height of 16 ft., and to an estimated possible amount of 35,000,000 tons in a month. An enormous steam engine was constructed in London for working 11 pumps of 63 in. diameter each and 10 ft. stroke, the maximum capacity of all which was to raise 112 tons of water 10 ft. at each stroke. These were set around the circular tower which contained the engine, and from the upper portion of which the balance beams radiated, one for each pump. They raised in actual work 66 tons per stroke, discharging the water in a large canal 38 m. long, and from 115 to 130 ft. wide. Two other similar engines were applied to the same work, and the pumping was continued from May, 1848, to July 1, 1852. Then the area was thoroughly drained. The entire expenses from the commencement of operations in 1839 to the close of 1855 were estimated at £748,445, which would be more than paid by the proceeds of the sale of the lands. The draining of the lake, however, increased a difficulty which will be appreciated by a consideration of the system of drainage in Holland. Along much of the seaboard of that country the waters of the ocean are kept from overflowing the land by immense dikes. The country is divided into several districts, called hydraulic administrations, each of which has three divisions of surface, viz. : natural lands, basins, and polders. The basins comprise the marshes, lakes, canals, and drains, having one surface level, which is below high and above low tide, and connect with the sea by sluices furnished with gates, which open when the internal waters are higher than the external, and shut when they are lower. The polders are lands which lie below the surface of the waters in the basins, and can only be kept dry by pumping. The Rynland hydraulic administration comprises 305,000 acres, which before the draining of Haarlem lake was divided into 76,000 acres of natural lands, 56,000 acres of basin, and 173,000 acres of polder lands; but since the addition of the lake to the latter, the basin covers only 11,500 acres, while the polder lands have an area of 217,500 acres. Now the basins are the reservoirs of the waters which are raised from the polders and also of the drainage from the natural lands. When the tides are regular, at every ebb they empty a portion of their contents, and thus maintain a capacity to receive the natural and artificial drainage until the next ebb; but if by the action of the winds the external waters are held at a higher level than those in the basins through the period of an ebb tide, a collection of water in the latter ensues, and may come to equal their capacity. Before this occurs, however, the pumping from the polders must cease, for some space must be allowed for the natural drainage. At about the mean level of the tides in the Zuyder Zee there is a mark upon a pile which is called the A. P., or Amsterdam pile, and which is the point of reference for regulating the height of water in the basins. There is also a mark for each administration, called the point of arrest. This point is not at the same level for all the administrations, some being allowed to continue their pumping operations longer than others. If the water in the basins were allowed to become too high, there would be danger of the overflowing and breaking away of the dikes. It will therefore be seen that the area of the basins is an important matter. If it bears only a small proportion to that of the land to be drained, they soon become filled, and unless they can empty their contents into the sea, the drainage of the polders must cease, and consequently they will become overflowed. As the range of tide along the Dutch coast is about 6 ft., only a small range of rise and fall, or capacity, can be allowed for the basins, when their area bears so small a proportion to that of the drained lands as it does in the Rynland hydraulic administration since the drainage of Haarlem lake has so greatly reduced the basin area. One circumstance has been taken advantage of in the work of draining, which is that the S. W. winds raise the level of the waters in the N. E. portion of the basins so that they may continue to discharge their contents longer than they could if they remained level. The S. W. end of the Zuyder Zee, also, by having its water level depressed, can continue to receive the drainage from the lands longer than if the surface remained level. The wind, therefore, is utilized as a source of work or energy, which goes far to make up for the loss incurred by diminution of the area of the basins. The draining of Haarlem lake had become a matter of necessity more than of utility; for, as it lies in a peat formation of great depth, connected with other lakes, the barriers were constantly being washed away, which, by increasing the surface of the water, allowed the waves to become higher by the action of the wind; and thus the surrounding country became subject to inundation. Fig. 1. - Section of an Underground Drain. Fig. 2. - a. Pipe tile. b. Sole tile. c. Horseshoe tile.